Around the time a woman reaches 45, there is one enemy with the power to threaten her confidence, steal her beauty, make her feel invisible, and turn even the pleasures of life against her. That enemy is Time. Most women feel that an essential part of them dies when their youth is gone, yet the reality is women can grow more beautiful, experience new pleasures, and accomplish their best work later in life. 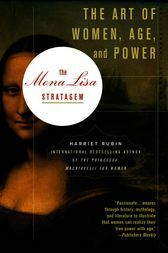 Now, taking inspiration from a masterpiece of female beauty, mystery, and immortality, Leonardo Da Vinci's Mona Lisa, Harriet Rubin reveals a powerful stratagem for finding happiness and fulfillment in midlife and beyond. Interweaving stories of iconic women throughout history, Rubin codifies ten tactics--including how to be noticed, how to create circles of influence with you at the center, and how to express talents that have been ripening over decades. In the process, she uncovers the key to mature power, the highest art of leadership.